Mutation Surveyor software, version 5.0 and beyond, includes a variant knowledge database allowing users to indicate false-positives and other artifacts, regions of significance, and high frequency variants by chromosomal position. Users can easily flag common artifacts and variants with the click of a mouse, adding the entries to the custom database to be remembered and queried for future projects. Also included in the knowledge base is a track manager tool that provides annotated results in the Graphic Analysis Display and Mutation reports. Annotation from external databases such as dbSNP, COSMIC, causative prediction from dbNSFP as well as custom database information can be added to mutation projects to highlight positions of significance. Figure 1: New track annotation pane featuring imported database information and chromosome location. Each green tick mark represents database annotation at that position. 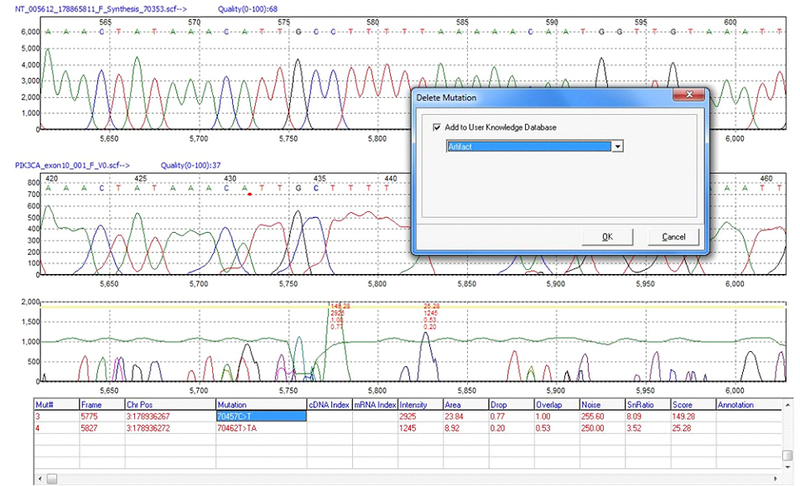 The Track Manager tool in Mutation Surveyor software allows users to import variant annotation from external databases that can be automatically queried for use in the Graphic Analysis Display and Mutation Reports. Annotation databases such as dbSNP, COSMIC, 1000 Genomes, and causative prediction from dbNSFP can be added to projects. Once a database is imported for a given preloaded reference, it can be automatically queried for new projects. Figure 2: Mutation report showing chromosome position and annotation column with database information such as dbSNP and COSMIC ID. The Variant Knowledge Base of Mutation Surveyor software allows users to track common edits made during variant analysis. 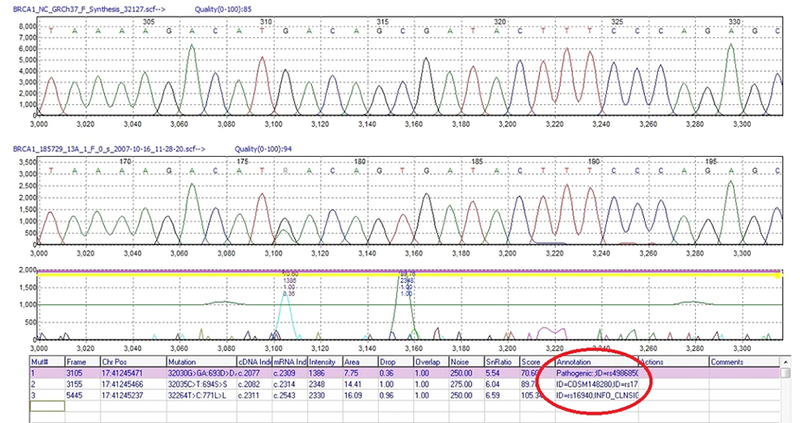 Predictable errors that occur near the beginning and end of sequencing runs can easily be added to the database as sequencing artifacts for automatic removal from future mutation projects. Alternatively, common false positives due to sequencing chemistries may be labeled as such and added to the database for further review. Figure 3: Deletions can be added to the User Knowledge Database and queried in future Mutation Surveyor projects. Use the Reference & Track Manager tool to import and manage preloaded references and data from any public or proprietary variant database.